For the past week I haven’t been able to scroll through Twitter or Facebook without seeing a picture or two of Pluto, and the news is inundated with more stories from the New Horizons voyage. This exciting time in space exploration is history in the making and the story has been in development for a long time. And the nine-year journey has led to an amazing before and after. 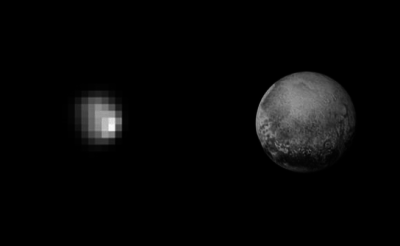 Before, we only saw Pluto in the form of a very pixelated graphic (left side of the above image). Now, we have an incredibly clear picture and are able to see that Pluto is home to 11,000-foot ice mountains (right side of the above image). I feel a kinship with New Horizons, because we started Lattice around the same time that the program was launched.Much like their journey, ours has had its moments of euphoria and terror. Our goal has always been helping marketing and sales professionals have a better understanding about their customers and prospects, so they could sell and market more intelligently. During this time, we’ve seen a proliferation of available data about our customers and prospects coming from marketing automation, CRM, social media and across the Web. As with New Horizons, this 100X increase in resolution has made it possible for marketers to better understand the prospects at the edge of their universes. Since our beginning, Lattice has focused on bringing predictive marketing and sales applications into the mainstream. We’ve helped more than 150 companies go from a pixelated to a refined view of their target buyers, consistently improving conversion rates and $/deals simultaneously. Improving resolution by 100X has required the development of new technologies in acquiring, matching, cleansing and analyzing data. And just like the New Horizons team, we are thrilled to have started our exploration of this poorly understood space.